Phnom Penh (FN), Feb. 8 – The Cambodian People's Party (CPP) issued a statement dated Friday to denounce the fake "CPP statement" distributed by opposition leader Sam Rainsy aimed at disuniting CPP, creating social chaos, and destroying the process of national development. 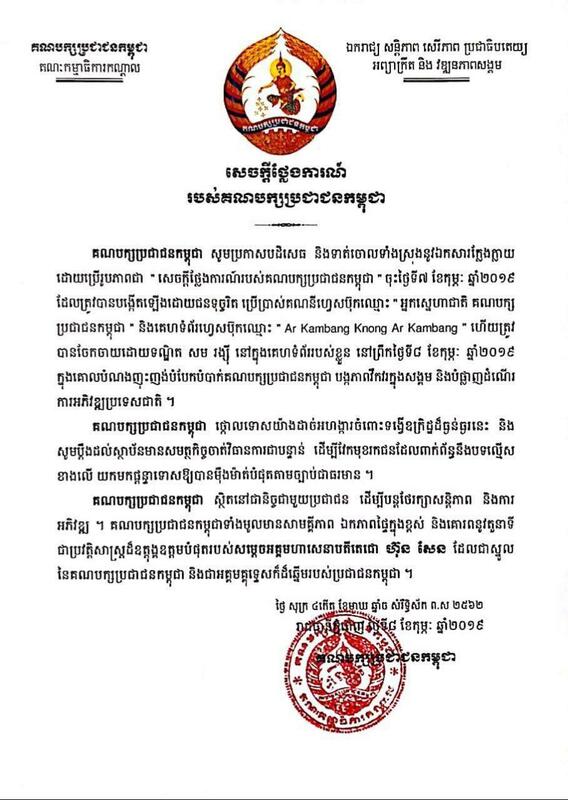 “The Cambodian People's Party would like to reject and denounce the fake documents dated February 7, created by ill-intended individual using Facebook page "Ar Kambang Knong Ar Kambang” and shared by Sam Rainsy,” the ruling party wrote in the statement. The Party strongly condemned the above serious crime and filed complaint to authorities to take immediate actions in accordance with the law in force. “CPP always stands with people to maintain peace and development under the outstanding leadership of Prime Minister Hun Sen,” the statement added.